This paper seeks to give an overview of the major issues connected to international trade for the countries of Southeast Europe. 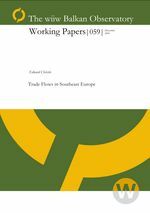 In its first part the paper revisits the issues of bilateral trade patterns and trade composition in Southeast Europe and looks at recent developments in terms of trade agreements and trade facilitation within the region and between the region and the European Union. The second part of the paper deals with the specific issue of trade in services. A gravity model for trade is estimated on European bilateral services trade flows. The estimation results are then used to produce forecasts for bilateral services trade flows for the countries of Southeast Europe.